Received your bonus or commission but wondering about the large deductions that are incurred? 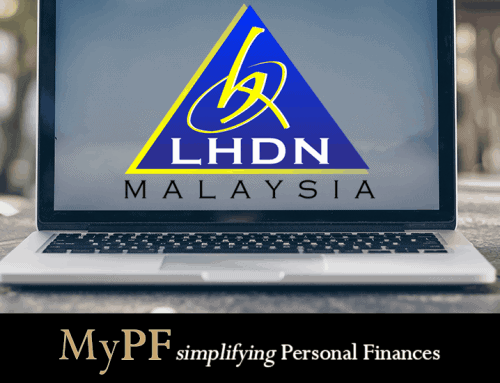 Find out how to calculate your Malaysian Bonus & Tax calculations. In 2009, Malaysia’s income tax moved to a Monthly Tax Deduction (MTD) or Potongan Jadual Bercukai (PCB). If you are earning on average less then 2,500 a month, you will not need to file taxes. Also as per announced in Budget 2014, you can opt not to file taxes if you are already paying MTD/PCB. However, you most likely would want to claim as there are deductions & you can get tax cash refunds. 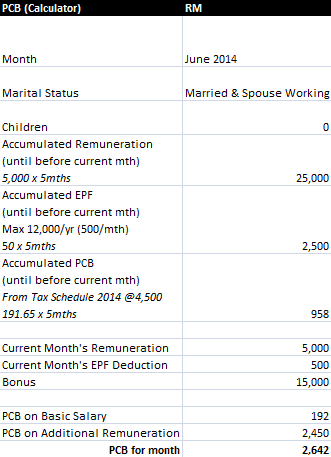 How PCB works is that your estimated monthly tax payable amount is deducted from your salary. Your employer would pay this amount to Lembaga Hasil Dalam Negeri (LHDN) by the 10th of the month. When you file your taxes annually, you would fill up tax-related info including your accumulated PCB for the year. If you have paid more then required, you get a refund. If you have paid less, you will need to pay the difference. Taxes in Malaysia are progressive. A progressive tax is a tax where the tax rate increases as the taxable base amount increases. The term “progressive” refers to the way the tax rate progresses from low to high, with the result that the average tax rate is less than the highest marginal tax rate. The taxable base amount is based on chargeable income. Salary & other remuneration less tax exemptions & tax relief. E.g. Both husband & wife working with 3 children. Husband 2 children deduction & wife 1 children deduction. Moving on, how does the calculation for bonuses work? 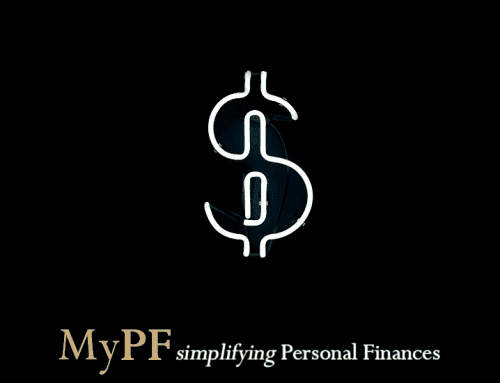 A rough estimate is that about 16% of your bonus would go into paying for taxes & 11% for EPF deductions. Thus you would only take home about 73% of your bonus. For a more accurate calculation, there are 2 ways that PCB is calculated. Companies may use either method. And you can calculate it yourself as well to check that it tallies. Key in monthly income, fixed allowances, and annual bonus. Q: I am getting employee benefits from my company. Is it taxable? A: Employee benefits (aka perquisites) are considered income and taxable. There are some exemptions as below claimable. 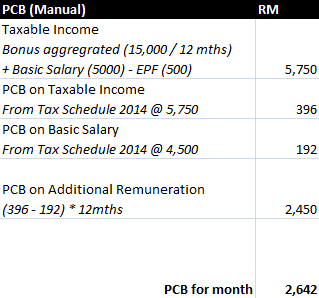 Does this accurately help you to estimate your PCB & take home pay during your bonus month(s)? Is there any information that needs further clarification? Thanks Gauthemen. Glad it’s useful! 1.Does the above include the deduction of tax for that current month salary ? 2. Or deduction for bonus only? Jane, good question. It’s for both the current month salary + bonus. Hi.. this is very informative and clear. Question, what if the employee receiving bonus is relatively new – say only 5 months into the job? Should I multiply X6 when calculating PCB on Additional Remuneration? Hi Eileen Yau. Good question there. The calculation for number of months should be based from when the employee joined the organization until the bonus declaration month. Hi Sateesh, Taxes are on all income, perquisites & benefits in kind. There are certain tax exemptions which are applicable including on leave passage outside Malaysia, traveling allowances/petrol (max 6k/yr), dental & child care benefits, parking & meal allowances. As long as you have it all in black & white it should be applicable. Best to check with a tax accountant though if unsure. Hope you’re having a good career & life experience here in Malaysia. If the new hiring company was buying the bond of existing company which I’m still work at. How the tax will be charge. Let’s said the amount is RM35,000 ? Can the tax be relief ? If the payout is attributed & recorded, it will count as income & be subjected to tax during your next tax submission. Tax relief would be subject to standard deductions. Hi, I have an Question, if only get pay for Bonus, which mean the Bonus Amount – EPF 11% – Income Tax (According to the Tax Table Schedule) = balance of the amount to be paid to the Staff, am I right? Bonus no need to deduct for Socso, correct me or not? Hi Angel, Yes you are right. Bonus is not subjected to SOCSO. 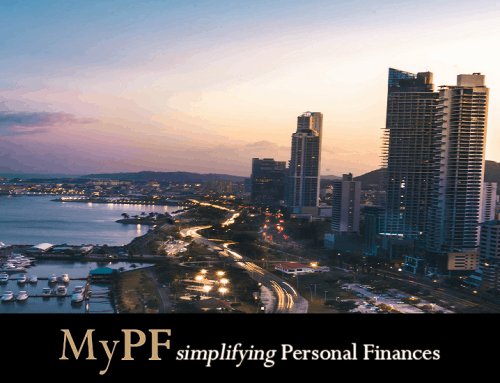 ‘Contribution to EPF or other approved scheme – 12000 (500/mth)’. Is this 6000 per year or 1000 per month? 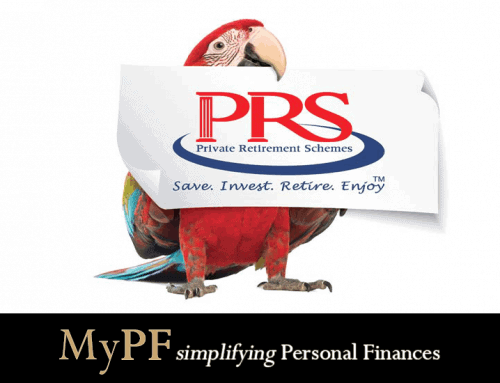 The contribution to EPF & other approved schemes is 6,000 for an individual per year. The article has been corrected to better reflect this. If Phone Allowance subject to monthly PCB Contribution? Hi Wong, for phone allowance it depends. If it’s a fixed monthly amount without receipts will be in PCB. If it’s a monthly phone bill with receipt reimbursement claims then it is exempted from PCB. Hi, If basic salary and bonus to be paid separately by employer. Is the PCB calculation for bonus is the same as above formula? Hi Megan, yes the PCB calculation for bonus would be the same even if paid separately. Hi! I’m Ryan here. I would like to know is medical leave & annual leave will consider in bonus payout. Hi Ryan, Your annual and medical leave will not be considered (unless it’s specifically recognised as income by your company – ie AL converted to cash). Hi! If I receive my bonus in Jan 2018, so how do I calculate my tax amount? Hi Grace, It depends on whether your bonus if for 2017 remuneration or 2018 remuneration. For example, if additional remuneration paid during 2018 is for previous year 2017 remuneration, taxation based on MTD calculation under Bonus Formula should be based on December remuneration for 2017. Suppose if I get a Salary of RM 7,000 anually and I have Annual Leave Encashment of RM 4,000 for last 12 Months which is to be re-imbursed in February. What should be my total tax Deduction? Please advise. I would like to know the calculation on monthly PCB deduct on my payslip, as i do the calculation and refer to the PCB schedule above, result is different. example: basic salary RM4k, Allowance RM1k, performance bonus monthly RM1k, how is the PBC calculate ? Hi Eric, A quick calculation shows around RM240 monthly PCB. The number may differ as well depending on how your performance bonus is recorded as. What is your monthly PCB versus your calculation? Hi, I’m Ken here. a car salesman with earning Basic + Commission. I would like to ask a question that help all of the salesman. Let’s say my commission for 1 car is RM2,000, I promise to give a full tank petrol, car tinted film, smart tag for my customer that cost me around RM1,200 on my own. so how to i declare the income tax which I’m not earning RM2,000 per car? because at the end of year mayb my annual total basic + commission is RM80,000 on EA form. But actually after deduct the free gift, my Annual income is just RM50,000. Hi Ken, I’m sure many salesmen will thank you for asking this relevant question. There are a few ways to approach expenses in the course of your business activity. 1. If you can claim the expenses from your company, you do not need to submit it as income. You will however need to keep proof of expenses & claims. 2. If you’re operating as your own business (ie registered as a sole proprietorship/partnership/etc), you can declare the expenses as part of your cost of doing business. 3. Unfortunately if you do not fall under the scenarios above, as an employee you are not able to deduct the expenses you incur to reduce your income. Hello, I am Jean. My company supports me on schooling costs. They pay directly, and school cost does not appear anywhere in my payslips. Is this a benefit taxable at my level, or is this similar to other types of company supports (e.g. temp accommodation during relocation), so not taxable benefit for me? Hello Jean, this employee benefit (aka perquisite) is likely considered as income and taxable. It depends through how your company treats it. You can check with your EA Form and company payroll/HR to confirm. Some perquisites are tax exempt though schooling costs are not. Hi, if my bonus out on Feb 2018 for previous year 2017 remuneration. Separate payslip with Feb 2018. My 2017 EA form doesn’t cover this bonus. So should I fill it in 2017 or 2018 (next year) income tax? Hi Casy, It will be part of your 2018 remuneration and (near year) income tax. I am getting outstation allowance from my company. Is it taxable & also needs to declare in Form EA ? Please advice . Thanks. Hi FEN, If your allowance is a fixed allowance it should already be recorded as part of your employment income which is declared in your EA form. If it is a travel allowance that is not fixed (meaning claim submitted), you still need to declare but as of tax YA2018, is exempted up to RM6,000 per annum for petrol & toll. What is the advantages/disadvantages (in terms of PCB and EPF deduction) of having bonus being paid together with salary versus bonus being paid separately? Hi Lin, generally the additional remuneration (bonus) will be considered as part of PCB & EPF calculation for the month that the bonus is received. Thus for PCB & EPF deductions, it will be the same calculation. Hi, I am Precilla here, I have a doubts for the Bonus payout example for Remuneration of YA 2018, we had pay the balance of Bonus during Feb’2019. Of course the EA form will not show the amount which is paid in Feb 2019.
they will be 2 scenario. My question is for personal tax, do I need to declare my income for YA 2018 or 2019? Hi Precilla, Bonus is treated as additional remuneration paid to employee either in one lump sum or periodical or in arrears or non fixed payment or any additional payment to a current month’s normal remuneration. Tax payment income will depend on when the bonus is received. If bonus is received in the same year (2018), tax will be based on the remuneration for the respective year (Tax YA 2018). If bonus is received in the next year (2019), tax will be based on the remuneration for that year (Tax YA 2019).